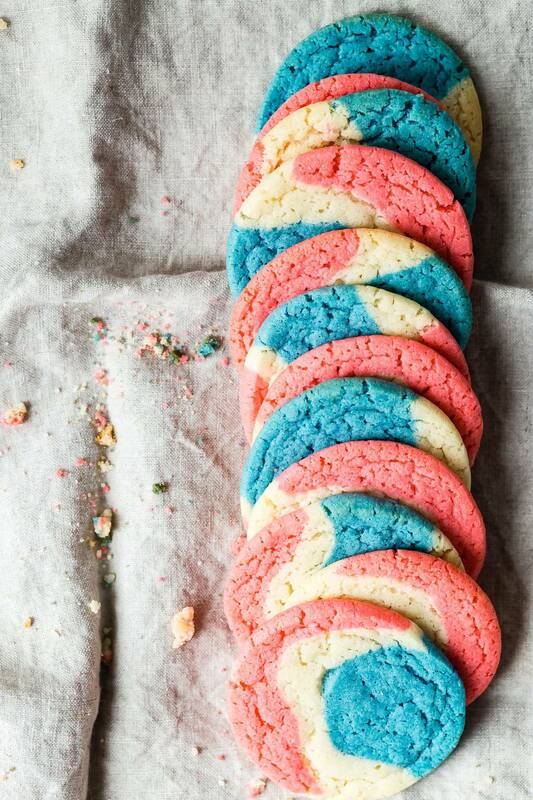 These patriotic red white and blue sugar cookies are perfect for your Fourth of July party potluck! It’s crazy how time flies by! 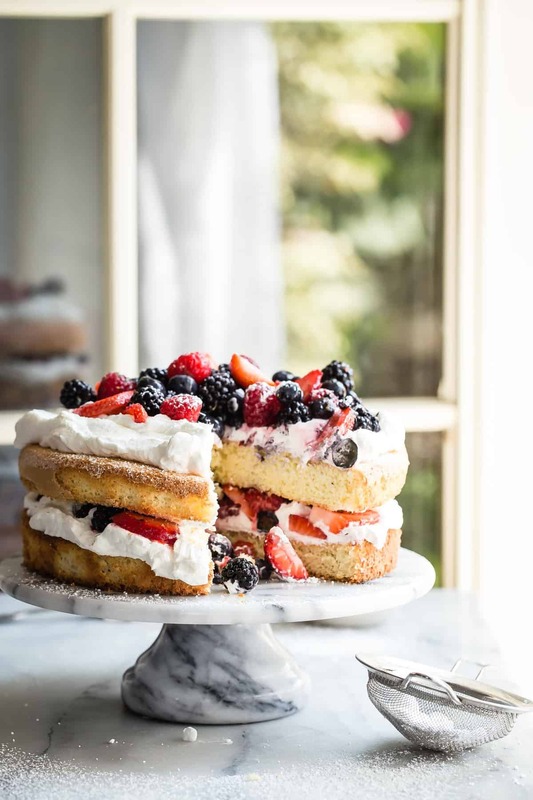 Here I am posting a Fourth of July recipe, school is almost out and I’m planning a summer vacation road trip (more on that later). 2018 you might well pack your bags because 2019 will be here soon! Okay, that might be a little too presumptuous but can you blame me? let’s just focus on the summer and how happy my kids are that it’s knocking on our door. We have camps for the kids, a road trip from California to Colorado and hopefully some camping thrown in. Summer 2108 is gearing up to be on the epic side! We always have a July fourth block party, as neighbors, we all bring a dish to a table and just have a massive potluck. We basically eat all day long. Check out this previous post for my best homemade peach barbecue sauce you’ll ever find! I usually make a batch of pulled pork and serve the sauce with that. But this year I think I’ll switch things up a little and make a sweet contribution to the street potluck. 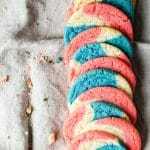 These red white and blue sugar cookies are fun to make and can be a great project for the kids to get in on. 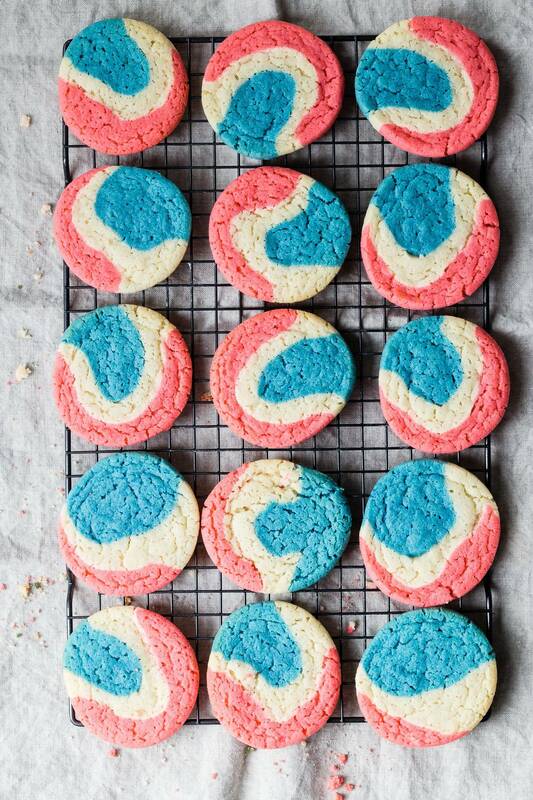 Simply make a batch of regular sugar cookies and divide the dough into three pieces. 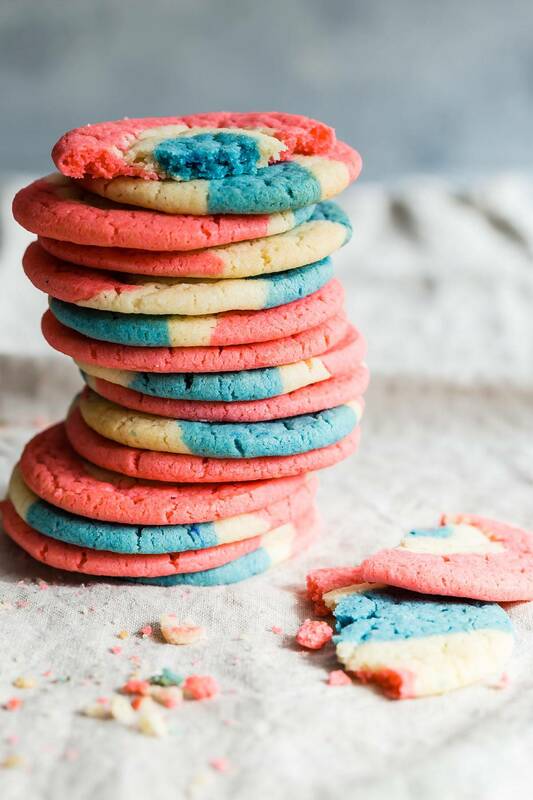 Leave one piece of dough as it is and add a few drops of red color to another piece and blue color to the remaining third piece of sugar cookie dough. 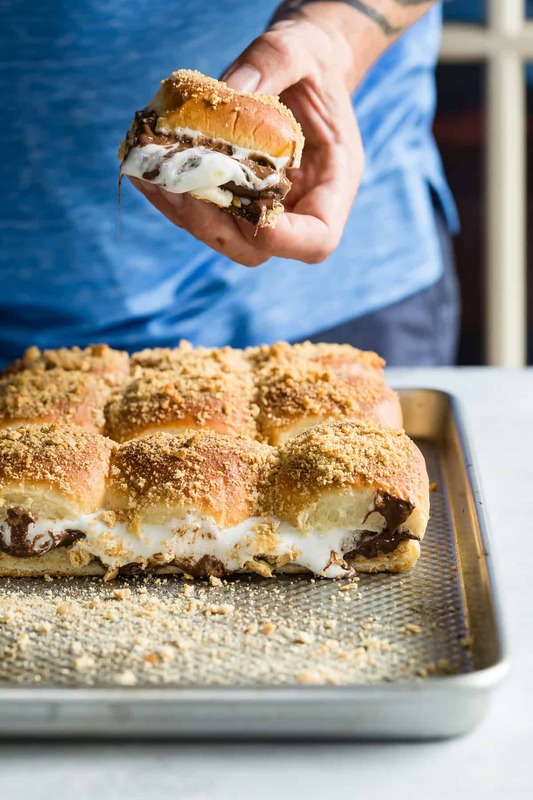 Roll each piece of dough into a log shape and stack on top of one another to create a large log, and that’s it! After a while in the fridge, you can slice them into rounds and bake, so easy! Let me know in a comment if you have any summer holiday traditions or must-makes that you have, and always remember to tag anything you make with @foodnessgracious because I love to see your work pop up in my Instagram feed! 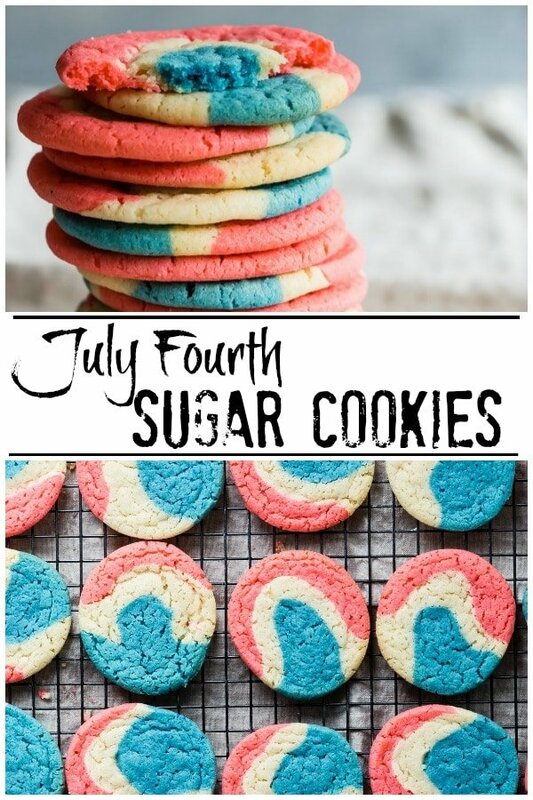 Here are a few more July fourth recipes you might like! In the bowl of a stand mixer (or use a hand mixer) cream the butter and sugar together until light and fluffy. Add the egg and vanilla and beat again until very smooth. Slowly add the flour mixture to the batter and mix until the dough comes together. Add one piece of dough back into the mixer and add a drop of red color mixing on low speed until the dough has turned red. Repeat the process with another piece of dough except adding a drop of blue color. You should now have one piece of red dough, blue dough, and regular uncolored dough. Roughly flatten out each piece of dough to about 6 inches long and then stack them on top of one another. Roll the dough into a sausage shape about 8 inches long and 2 inches wide making sure it's nice and even. Lay the roll of cookie dough on a piece of wax paper and wrap up tightly like a tube. Let the dough rest in the fridge overnight or at least 6 hours to firm up. Preheat the oven to 400 degrees F and line a couple of baking sheets with parchment paper. Unwrap the roll of cookie dough and slice into discs about 1/4 inch thick. Lay each cookie onto the prepared pans and bake for 8-10 minutes depending on your oven, the edges and bottoms should be a light golden color. Transfer the baked cookies to a wire rack to cool and repeat until all the cookies have been baked. SO festive. Perfect for the 4th! OMG these are so fun and I love how easy they are! Can’t wait to make these all Summer long! These are perfect for MDW! These are so fun Gerry! And pretty too! These are so easy and perfect for Memorial Day weekend! SO festive! They’re perfect for this weekend!